How can such tiny broken hearts like ours hold the GREAT I AM in all His fullness? Our hearts require enlargement and corrected upgrades. God takes loving responsibility to make more room for Himself in our hearts when we keep saying “YES” to Him so we can come into greater measures of His Love. He creates life experiences or works with human choices and circumstances that take on the character qualities as a vortex, pulling us into forces that pull on the heart. Sometimes the heart tears. It can feel like its dying in these enlarging experiences. 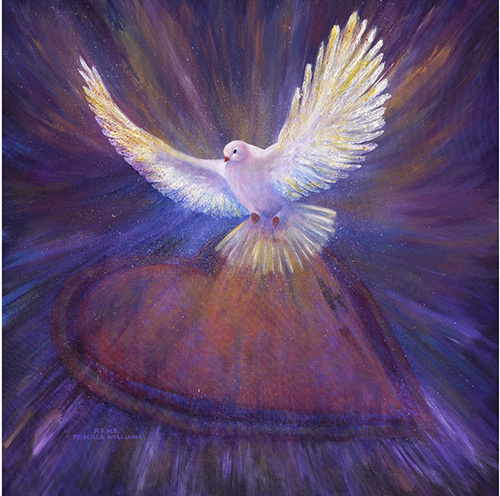 Holy Spirit, the Comforter (symbolized as a dove), comes and hovers over these tears, these challenging and often painful experiences, to counsel, guide, direct and heal the heart being prepared for greater capacity to love and be loved.